Jonathan Kaldor, Doug L. James, and Steve Marschner. In Proceedings of SIGGRAPH 2008. Held in Los Angeles, California, August 2008. A still frame of a scarf falling on an inclined plane. Knitted fabric is widely used in clothing because of its unique and stretchy behavior, which is fundamentally different from the behavior of woven cloth. The properties of knits come from the nonlinear, three-dimensional kinematics of long, inter-looping yarns, and despite significant advances in cloth animation we still do not know how to simulate knitted fabric faithfully. Existing cloth simulators mainly adopt elastic-sheet mechanical models inspired by woven materials, focusing less on the model itself than on important simulation challenges such as efficiency, stability, and robustness. We define a new computational model for knits in terms of the motion of yarns, rather than the motion of a sheet. 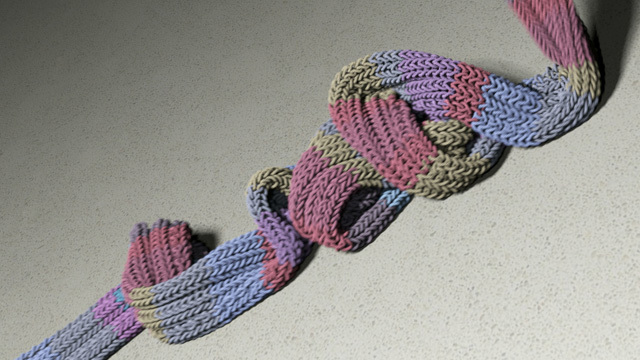 Each yarn is modeled as an inextensible, yet otherwise flexible, B-spline tube. To simulate complex knitted garments, we propose an implicit-explicit integrator, with yarn inextensibility constraints imposed using efficient projections. Friction among yarns is approximated using rigid-body velocity filters, and key yarn-yarn interactions are mediated by stiff penalty forces. Our results show that this simple model predicts the key mechanical properties of different knits, as demonstrated by qualitative comparisons to observed deformations of actual samples in the laboratory, and that the simulator can scale up to substantial animations with complex dynamic motion. This paper is available as a 5.9M PDF file or as a 1M PDF file with low-res images. The associated Computer Animation Festival video is available as a 9.5M Quicktime movie.